Anyway, I felt the urge to make something using pumpkin this weekend to celebrate Halloween. As you can probably imagine, I’m a bit tired of pies recently, so pumpkin pie was not my choice. 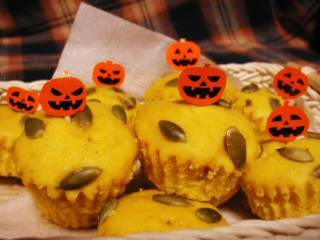 Instead, I baked some cute Pumpkin muffins yesterday. 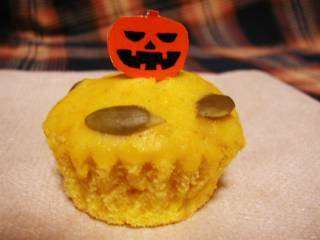 The recipe is from my favorite muffin book, ” Itsudemo Muffin – Muffins & Quick Breads” by Asa Shiokawa. This is a real nice book. What’s so nice about the book is not only the recipes included but also the PHOTOS!! The photos of muffins/quick breads in this book look so nice with a great effect of the natural sunlight and shade. Oh how I long to be able to take photos like them and post to my foodblog!! It tastes very sweet and its flesh is (almost like sweet potatoes or chestnuts) not as moist as the pumpkins you usually use for pumpkin pie, I guess. 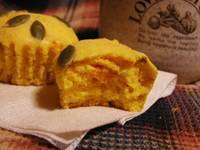 This kabocha is very good for this type of pumpkin muffins, because about 2/3 of the pumpkin called for in the recipe is not pureed but added to the batter as pumpkin chunks. And the chunks give a little snap of pumpkin flavor, which goes really well with the salty pumpkin seeds on top. 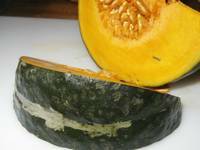 See the orange-colored pumpkin chunks inside? The recipe says the muffins would be good with cinnamon butter, too. 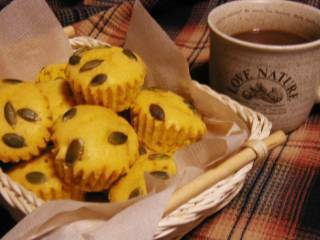 I’m usually a coffee drinker, but today, with these muffins, I felt like having hot cocoa. 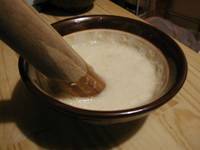 to make the paste with great fragrance that I can enjoy for several weeks (or maybe a couple of months?). Yes, primitive. But this gives me some work to do to kill time when I have nothing else to do, so it's OK. I only make a small amount at one time anyway. Other than spaghetti, I love potatoes or fish meuniere (is this French, BTW?) 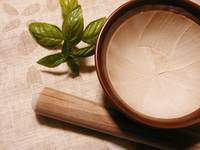 with basil paste. It’s too bad that the beautiful green color of the paste didn’t show much in the photo. Honestly, it was so appetizingly green!! 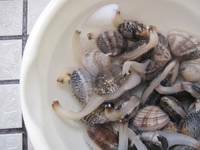 I’m not sure what their English name is (maybe littleneck clams? ), but we call them Asari in Japanese. 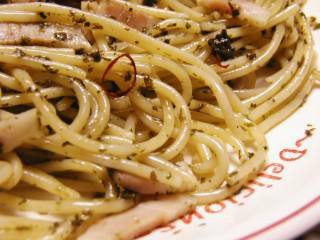 This is what I had for supper tonight, and here’s the recipe, if anyone is interested. Soak Asari in salt water for several hours (I did overnight) to remove sand. Wash and put in frying pan set on medium heat. (Add minced ginger and garlic with a little water, if desired.) Cover with a lid. When some start opening (you can hear), add sake and salt (pepper and soy sauce, if desired). Cover again. 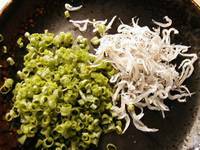 When all Asari opened, sprinkle minced scallion and serve immediately. I squeeze lemon or sudachi over Asari just before eating. Many recipes on the net seem to use minced ginger & garlic and soy sauce, but I personally like the simpler seasoning when using fresh Asari and good Sake. 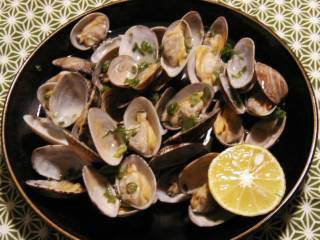 If you like it in a Western style, use wine instead of sake and add some butter, then sprinkle minced parsley instead of scallion. Pears are my most favorite fruit. 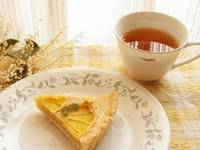 Ever since I tasted a tiny, expensive piece of pear tart (with canned pears) in Japan long time ago, I’ve been in love with the fruit. One of the happiest moments of my stay in the U.S. was when I found a pile of green pears at a local supermarket, and at a low price!! I envy all the folks who can eat fresh pears whenever they want!!! These days, a kind of pear called “La France” is available in Japan, but it’s still a little different from the kind I loved in the U.S. (and rather expensive). 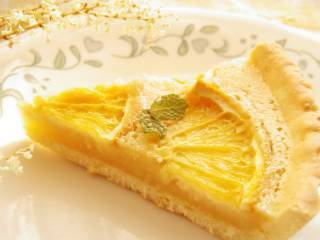 The good thing is that, unlike our nashi, the “La France” is suitable for sweets like pies, cakes and tarts…. So, today, I tried out the recipe of “Sour Cream Pear Pie” in the Women’s Circle For Cooks on the Go (1992) that I mentioned before. This one looked so attractive to me because it uses sour cream, not custard cream like many other pies. I couldn’t imagine what the taste would be like with the sour cream, so I just HAD TO try it. 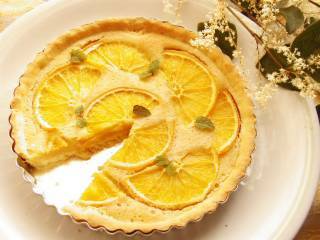 I didn’t have an unbaked pastry shell from the store, so I made a tart shell from the orange tart recipe. Placing the sliced pears on top was my idea, but maybe not a good one, because it took longer for the pie to get done. 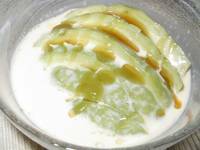 Well, the taste of baked pears with the cream is wonderful. The only thing is that before I take a bite, some kind of distinctive smell bothers me a little. I don’t know if it’s from the pears or the sour cream…. I guess I like custard cream better for this kind of pie. 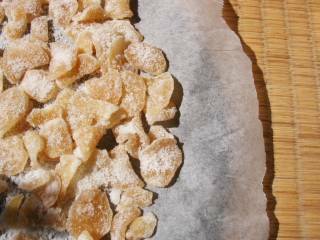 Yesterday I made something like what you call crystallized ginger, following a Japanese recipe of candied(?) ginger. I’m not sure if what I made is the same as your crystallized ginger, but it is indeed sweet and has pretty strong ginger flavor, so I’m happy with the result. Can’t wait to use some for baking! I’m posting a few photos from a “local specialty fair” that I went last Sunday. You can see some more photos from the same fair here if you are interested. My chocolate cake was finally gone yesterday, so I was all ready for something new today. 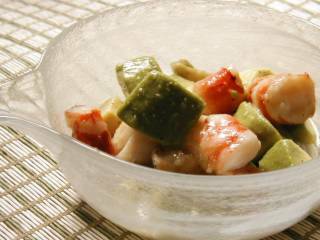 Something that uses some fruit and doesn’t require too much whipping. Actually I could take a break from cakes for a while. 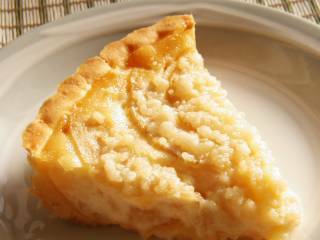 Today, in my good old Women’s Circle for Cooks on the Go (1992), I found an attractive pear pie recipe. But the pears (La France) I bought this morning were as hard as rocks. 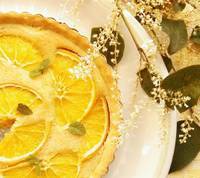 So I decided to give them some days to get ripe, and instead picked an orange tart recipe on the net. This was actually my very first time making the tart shell myself. It wasn’t as difficult as I expected. 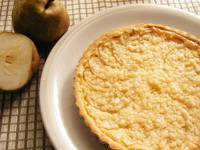 To my relief, nothing was really difficult or too complicated about making this tart, and this time I didn’t even have to size down the recipe. The taste wasn’t exactly what I expected --- it was a little too light. Maybe I should have used more grated orange rind or used orange liqueur though it wasn’t included in the recipe, and added more sugar to the filling. The filling was made from almond powder, eggyolk, butter and sugar, but I guess I like custard filling better. Still I should say that I had a lovely tea time today. 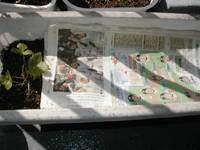 Oh, the flowers in the photos are Japanese knotweed. They’re blooming just everywhere now, and my Japanese friends would probably laugh at me for using them for tea-time decoration. After spending one gloomy day in the bathroom yesterday, they are enjoying the sunshine now. 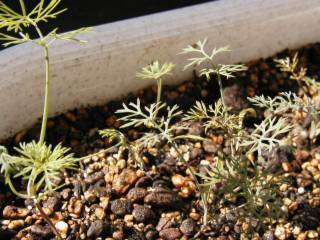 These are photos of my herbs that were not included in my previous posts (except the dill). 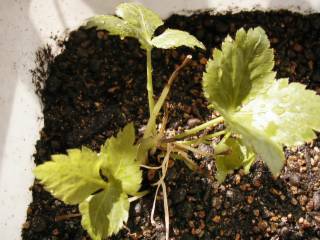 Is it a stupid idea to grow rhubarb in such a small planter? Looks like this is the kind that hugs the ground. 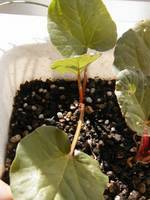 This one grew from the root of mitsuba that I bought for cooking. The rain and wind is getting worse outside. The typhoon TOKAGE is supposed to hit us this afternoon, and I'm waiting for a call or an email from the office telling me "NO WORK TODAY." 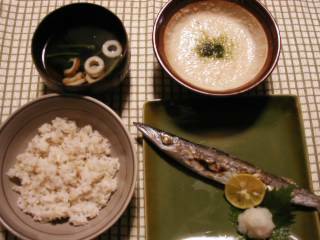 In the meantime, I'm going to post some Japanese dishes I made recently. After I bake/cook something fatty or very sweet, I usually rest my stomach with our traditional meals. This was my supper last night. 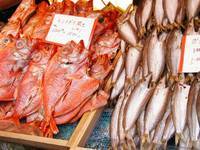 The fish is Kamasu (red barracuda). 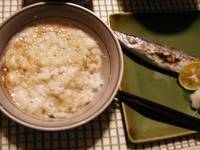 The sticky-looking thing in the bowl is grated Chinese yam seasoned with dashi and soy sauce. We pour this over rice to eat. Supposed to be very nutritious. Satoimo (Japanese taro or aroid?) 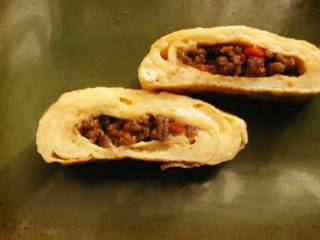 simmered with ground meat (beef and pork). I used the ground meat to clean the freezer, but it made the whole thing too greasy. I definitely should have used ground chicken. ....... No phone call/email yet. Am I going to have to ride a bicycle in this rain and wind?!!??? A tireless effort has been made to find a way to use up the soy milk that I don’t like. 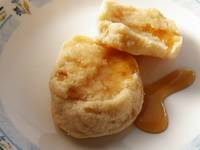 What I was looking for was a recipe of very sweet cake or muffins that calls for milk or buttermilk. I can replace the milk/buttermilk with the soy milk, right? 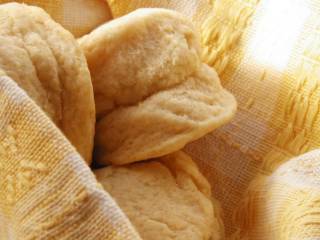 And the cake/muffins should have a strong flavor that hides the taste and smell of soy milk completely. So the idea I found was: Chocolate cake recipe that calls for buttermilk . Fortunately there’s a small can of Van Houten cocoa in my kitchen. It was given to me as a present last spring. I know cocoa is very good for health, but I’m a coffee drinker (or a caffeine addict) and don’t drink cocoa very often, so there’s still a lot left in the can. I don’t remember if I told you this before but whenever I try recipes, I reduce the amount to half, because I live all by myself and I'm the onlyl one to eat up whatever I make. My friends here are always, ALWAYS on a diet, or what they call puchi(petit)-danjiki (short-term fasting ?) 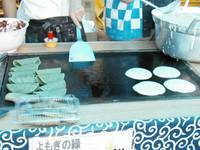 which is popular in Japan now, so they would NEVER share the dessert I make. I understand the effects of fasting when it’s done properly, but the way my friends are doing is like just stop eating for several days, without taking any vitamin or other supplements, then hog bunch of fatty junk foods all day, and go for another round of fasting…. I really doubt if this is doing them any good. Anyway, I reduced the amount of the ingredients as usual, then the amount of soy milk I needed was just 1/2 C. Hmmmm…not much, but better than nothing, of course. I wondered if I could use some more soy milk in frosting, too. Then Uncle Phaedrus answered me with this recipe of chocolate buttermilk frosting. Also not much, but better than nothing. The cake turned out much lighter than I expected and it was good because the frosting was pretty sweet. I’m very satisfied with the result, but I don’t think I can eat much at one time. .... and still I have some of the soy milk left. Avocados were on sale today! With the rest of the Avocado, I tried the idea that I got from OsloFoodie's site recently and was dying to try out. I went for a sketching excursion yesterday, and this was the lunch I brought with me. This time I didn't want to spend too much time on it, so I went for something quick & easy and also very popular when I was a kid. Gee, I still remembered how to do this! 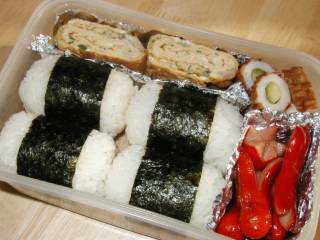 In my elementary school days, I practiced this quite a lot when I packed lunch for my younger sister's school excursion. 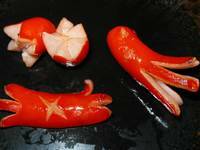 We also loved to have the crab- and octopus-shaped ones in our yakisoba (stir-fried noodles). 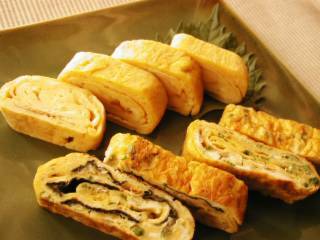 Tamagoyaki (fried eggs or rolled omelet): Usually kids like it sweet, but my mom's mother sometimes made savory one for me. 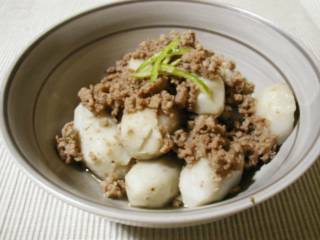 The eggs are seasoned with salt, soy sauce and MSG but no sugar, and chopped scallions (often with dried baby fish) are added. 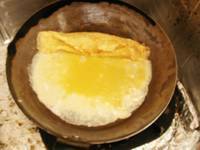 It's important to fry thoroughly until it looks slightly brown in order to bring out the natural, subtle sweetness of the soy sauce and eggs. I made the savory kind today. 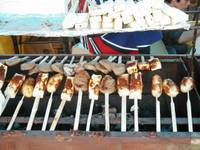 The cucumber stick in chikuwa (steamed and grilled fish cake ): This always comes in handy. No seasoning necessary, and looks kind of nice in a lunchbox. 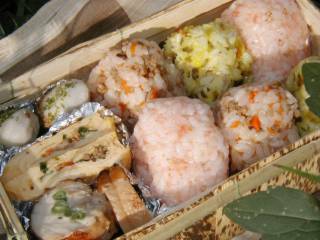 And for making this kind of rice balls, I never use plastic wrap. 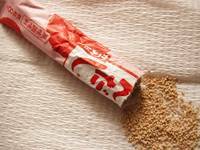 These are the typical ones my mom always made in my childhood, and at that time, plastic wrap was probably already invented but not yet popular in my hometown. So, the image of this kind of rice balls was imprinted in me without the plastic wrap, and now I just can't relate them in my mind. They were so light and fluffy. 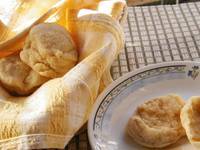 (I used self-rising flour.) Next time I might try adding some buttermilk powder. This is wha I made yesterday. Just from looking at this photo, it’s hard to tell what was actually wrong, but the problem was the taste. 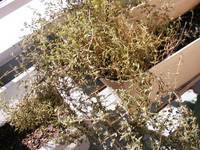 This is how it went wrong…. I like soy milk very much, but a few specific brands only. When I went to the nearest supermarket the day before yesterday, they were out of my favorite brands of soy milk. There was no choice, then. I bought the one I’d never tried before, and I regret that I did. At home, after I tasted the soy milk, I yelled out “Oh No!” and had absolutely no idea what I should do with the 1000ml carton. To me, the taste was just awful. Perhaps the best thing to do would be using it for cooking and baking. I remembered that I once made "wonton in soy milk soup" before, and it was very good. At that time I used my favorite brand, but if in a soup, different brand shouldn’t matter too much, I thought. So I came up with an idea that takes care of this soy milk and other leftover vegs in the fridge, plus the noodles that were on sale on that day: Ramen noodles in soy milk soup with stir-fried seafood and vegetable on top. 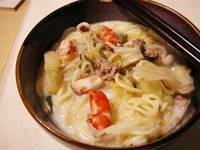 Yes, something like "Champon noodles,” the local specialty of Nagasaki prefecture in Japan. I made soup using instant chicken-consommé, seasoned it kind of heavily with salt and pepper, then poured in some soy milk, directly from the carton. The taste was nothing marvelous but still OK. Then I poured some more, trying to use it as much as possible so that I can get rid of it sooner. It was another big mistake of mine. When I tried to pour, too much soy milk came out from the carton at once and I couldn’t stop it. It ruined the soup completely. I didn’t taste consommé, salt or pepper. All I could taste was the soy milk that I didn’t like!! I did everything I could think of to fix it, and it got better at the end… but the amount of soup almost doubled. Even with the stir-fried seafood and vegetable on top (I made them rather spicy), and some hot sesame oil I added just before eating, the strong smell and taste of the soy milk bothered me all the way. And still I have some of the soy milk left…………… sigh. Maybe I should use it for some kind of very sweet dessert, with bunch of spice and/or flavoring extracts. Well, time to make use of the ginger and lemon from the Sunday market, and of course, the Manuka honey!! 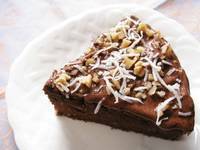 I found a recipe of gingerbread cake at this site, RoseWave Recipes. 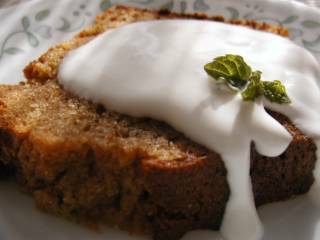 There were some other gingerbread cake recipes, but the lovely design of this site was too attractive as well as the recipe itself. The only problem was that I didn’t have any crystallized ginger at home. Actually I have never seen such a thing around here. But I didn’t want to give up this recipe, so I decided to go for a rather risky experiment. 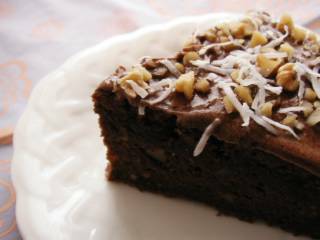 Now, the reason why I wanted to bake a gingerbread cake was to try the Manuka honey for baking, so I was definitely going to use the Manuka honey instead of the molasses. Other changes: I decided to omit crystallized ginger and use more fresh ginger to compensate for that, and add some grated lemon rind in the cake. With this many changes, the taste could be completely different from the original recipe, I thought. To stay on a safe side, I reduced the amount of each ingredient to one-third of the original amount to bake a small cake. The only exception was minced fresh ginger root --- I doubled the original amount. This kind of experiment is so thrilling, don’t you think? The waiting time after putting the batter in the oven seemed like forever, but finally, the cake was done. I knew I was supposed to wait until it cooled, but I couldn’t help cutting off a tiny piece of the warm cake and taking a bite right away. 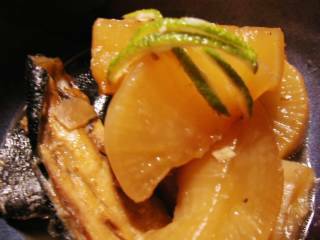 It was just so sweet, without much of the taste of ginger or lemon rind. Then I thought ... maybe lemon sauce with butter and egg yolk could be too much with this cake which is already so sweet? Should I make something lighter? Something like…. Lemon yogurt sauce? So, time for another struggle. I mixed yogurt, a little sugar, lemon juice, sour cream and whipping cream, adding a bit of this and then a bit of that, tasting after each addition. Still it looked too thick, so I ended up adding some milk to make the sauce runny and smooth. After the cake cooled down, the flavor of the ginger and lemon got stronger, and the sweetness got somewhat milder. To my relief, the cake tasted good with the sauce, though I wasn’t sure if that was the best match. 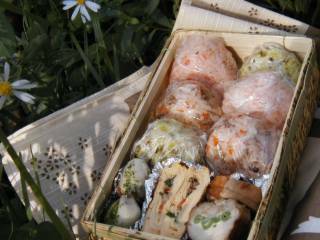 When the weather is gorgeous like this, I can’t resist the urge to pack my lunch and eat it outside. Sometimes I grab just anything in the kitchen, and other times I feel like packing a very special lunch, taking time for preparation. Today I felt like the latter. So here’s what I brought to the park which is a part of the Castle Garden here in this city. This retro-looking lunchbox is again from the 100-yen shop. 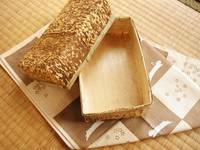 Bamboo sheath was said to be widely used in Japan in the past (maybe until 50 to 100 years ago?) to wrap rice balls to bring to work. Now we use plastic lunchboxes, but the retro-looking ones are still available. I don’t think they’d look good at school or in the office, but perfectly appropriate for picnicking. The tiny taro potatoes were microwaved, salted, then sprinkled with green laver. This was an idea I got from a women’s magazine, but they didn’t taste as good as I expected. Maybe I microwaved them too long. Then, the small fried eggs. What you see in the center is minced scallions with the kochujan-seasoned stuff I made for the rice balls. What was a hit this time was the rolled chicken with dwarf French beans(?) in the center. I just love the way it looks when sliced. The dwarf French beans could have used more seasoning, but the garlicky teriyaki sauce I made to season the chicken was a big success. I was lucky that almost no one, except one young couple playing catch in the same park, was there to watch me taking so many photos of my lunchbox. ; ) I wanted to include some lovely autumn flowers in the photos with my lunchbox, but it was harder than I thought. Maybe the couple were watching me and laughing, but they at least didn't show that to me. Thanks, guys.